Last week I had the pleasure of attending AVI-SPL’s Global Sales Meeting in Tampa, Florida. The Global Sales Meeting is a weeklong annual event held at the Saddlebrook Resort, which plays host to an equal mix of roughly 500 AVI-SPL salespeople and manufacturer partners. The whole event is paid for by these partners—since AVI-SPL is easily one of their top customers (if not, top customer) getting one-on-one time with the integration company’s sales staff pays for itself. 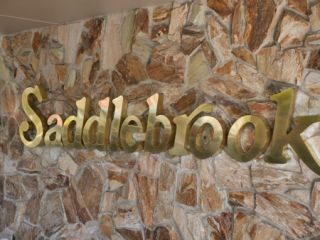 The Saddlebrook Resort is a beautiful and spacious retreat close to AVI-SPL’s headquarters in Tampa. There’s a spa, 18 holes of golf, pools, lagoons, and flora and fauna native to that part of the country. While the event takes place over a few days, I was only down there for 24 hours to take part in the Media and Analyst Day. This was an action-packed day of interviews, presentations, and discussions that a handful of us were invited to attend. Since it’s essentially still winter in New York, I had no problem making a quick visit to the warm Florida sun. The day was arranged by Krystle Czajkowski, AVI-SPL’s PR mastermind. It kicked off at a 9am breakfast with Ms. Czajkowski. There, she gave us our schedules for the day, and also gave us some details on the event. This is the second year of the Global Sales Meeting. Prior to that it was the National Sales Meeting, but because of AVI-SPL’s expansions into Canada and London, the “Global” moniker was adopted. The theme of this year’s Meeting was “In The House”, which was a nod to all the resources and expertise that the company offers in house. If you catch a hip-hop reference in this theme, you’re not alone—some of AVI-SPL’s higher-ups recorded rap videos for the event, though they were kept tightly under wraps and not made available to members of the press. After our breakfast, we were treated to a presentation by John Zettel, CEO, and Mike Brandofino, executive vice president of video and unified communications. They presented some impressive stats on the organization. AVI-SPL is the world’s leading systems integrator, with 1,700 team members around the globe and 7,700 projects started last year. Of the top five integrators, it took 46 percent of the revenue pie in 2013. Services continue to make up a larger chunk of that revenue. The 2013 sales breakdown was 65 percent integration, 24 percent services, and 11 percent box. That’s compared to 70/14/16 in 2012. In fact, services alone would make AVI-SPL one of the top 15 integration firms. Brandofino also demoed the company's Virtual Meeting Room (VMR) service, which supports all levels of communications, from Microsoft Lync to fully immersive telepresence rooms. It leverages the company's Cisco VMDC architecture, Nexus and UCS platforms in the core with Pexip Infinity software to create a scalable option for virtual meetings. Version two is coming out next month. Next, we got a quick look inside the main hall where a full stage show had been put together by the company’s live events team. There was some impressive projection mapping at work—especially considering this was solely set up for “In The House” purposes. Digital Projection TITAN Quad projectors powered all the large screens in the main hall. After a nice lunch in the Florida sun, it was time for my one-on-one meetings in the Partner Pavilion—a mini tradeshow taking place at the event. For these one-on-ones I was paired up with Danny Rogers, AVI-SPL’s director of channels EMEA. Danny previously worked for both Polycom and LifeSize. He was a terrific guy and really knew his AV. Our first stop was Crestron, where we chatted with John Gutekunst, executive director, about the company’s relationship with AVI-SPL and what it gets out of the Global Sales Meeting. Crestron is the number one vendor for AVI-SPL, and because of that sees itself as part and parcel in the client relationship. The two companies share many discussions about industry trends and look to each other for direction. Second we met with Polycom, which has named AVI-SPL its North American Partner for two years in a row. Both Lisa Ayers, vice president of enterprise sales east, and Colleen Murrel, director of channels, chatted with us about the importance of the relationship between the two companies, and explained that AVI-SPL is everything they could want in a partner—the company is global, has a global help desk, strong Lync practice, well trained staff, and a strong AV heritage. They also stressed Polycom’s Lync advantages, the fact that Lync has native integration into Polycom, and the fact that Polycom is a platinum Microsoft partner. After that we visited with Cisco’s Walter Fuller, a partner account manager, who couldn’t say enough about the importance of the Global Sales Meeting. He saw it as an excellent opportunity to get field-level feedback and spur collaboration. We made a quick stop at Christie’s booth, which was showcasing the company’s Brio screen sharing application. With Brio any device can connect to a display without an app or dongle. It’s definitely a worth entrant into the rapidly growing screen sharing category. Next we headed to Biamp and met with Read Wineland, eastern regional director, and Mike DeFreece, regional manager. They come to the Global Sales Meeting every year and see it as a great way to get everyone at AVI-SPL up to speed with new products. A special factor was the social informality that hanging at Saddlebrook offers—connecting with sellers over a beer at the bar offers great opportunity for collaboration and brainstorming. Our next stop was SMART, which was demoing its SMART Room System for Lync. Everyone at the Global Sales Meeting was talking about Lync, and SMART was no exception. SMART’s CTO used to be Lync’s CTO, and much of the executive leadership is ex-Microsoft. Ryan Blomfield demoed the system for me—he described it as an unbound workspace that functions as an all-in-one solution for Lync. Some of the capabilities it adds to Lync include interactive sharing and the ability to annotate and save PDFs. Finally we visited with Sharp, where Steve Brauner, senior product manager, demoed the Aquos Board 2 for us—a 10-point multitouch digital whiteboard that was being shown for the first time ever at the event. Sharp has roughly 60 percent of the digital whiteboard market, and is one of the key flat panel providers for AVI-SPL. He also showed us the company’s new 90-inch display, which was nothing short of stunning. All those visits took less than two hours! It was an informative whirlwind. Danny and I had a few minutes to kill so we went and had a coffee and chatted AV. My day was capped off with a half-hour one-on-one with Mike Brandofino, Andy Olis, senior vice president, and Don Mastro, executive vice president of sales. They really are three of the nicest guys out there, and we had a terrific chat. Look for more details in the May issue of SCN.